It could be argued that the Asian baby was rather thrown out with the Turkish bathwater in 2018, as a stronger dollar, weaker commodity prices and Istanbul’s foreign borrowing woes all served to weigh on emerging markets overall. Those investors with substantial asset allocations to the Asian region will be content to ride out the storm, arguing that relatively lower levels of debt, especially in dollars, and superior current and fiscal accounts leave the region less exposed to flows of hot (or frightened) fund flows. After all, emerging markets have bounced back from prior losses of market confidence with great speed to produce premium long-term total returns. Equally, attention will have to be paid to the Australian housing market, which seems to be creaking in a manner eerily reminiscent of the American housing bust of 2007-09, and China, where growth seems to be slowing, despite whatever the headline GDP figures may say. The Shanghai Composite index is now in bear market territory and is stuck at early-2007 levels, despite the huge economic progress reported in the interim, to reflect concerns over the quality of that growth and especially a reliance on debt. A sudden bout of weakness in China’s previously high-flying internet stocks is not helping either. By contrast, India’s SENSEX index continues to motor higher, buoyed by strong economic growth and Prime Minister Narendra Modi’s reform programmes, although he faces a General Election in April and May which could yet turn out to be less straightforward than many assume. The clock is ticking. Unless something unexpected happens, America will increase tariffs on $250 billion of selected Chinese goods from 10% to 25% and look to slap import taxes on a further $267 billion of products. How China responds to President Trump’s tariff assault and ‘America First’ policy could be crucial, for President Xi Jinping personally, the Communist Party and the wider Chinese economy. Asia-watchers will need to keep their eyes on three other key political issues in 2019 and beyond. The first is the continued negotiations between North and South Korea. The second is the scope for another rumpus in Australia. Scott Morrison became Prime Minister in August after Malcolm Turnbull’s tempestuous near-three-year reign came to an acrimonious end following mass Cabinet resignations. Morrison is the sixth Aussie PM this decade, but how long he will last is open to question. He has already called an election for 2 May, lacks a majority in Parliament and trails Bill Shorten of the opposition Labor Party by 10 percentage points in the polls. The third is India’s general election, which is scheduled for April and May 2019. The National Democratic Alliance (NDA) of Narendra Modi is defending the huge majority claimed in 2014, when it swept aside the United Progressive Alliance (UPA), within which the Indian National Congress (INC) was the lead party. The INC, traditionally India’s ruling party, put up its worst-ever showing as it won less than 10% of the vote, to suggest Rahul Gandhi has his work cut out to get the family dynasty back in power. However, Prime Minister Modi’s own party, the Bharatiya Janata Party (BJP) only pouched 31% of the vote, the lowest figure for any party to form a Government since independence in 1947. As a result, the 2019 outcome is no foregone conclusion. Modi has made great efforts to reach out beyond its Hindi heartland and especially into the North East of the country. 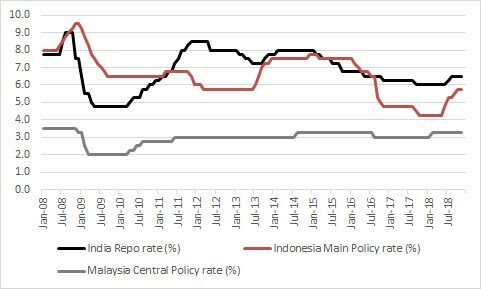 Interest rate increases in India, Malaysia and Indonesia all represented a marked change in narrative for the Asia-Pacific region and may have contributed to the area’s disappointing equity market performance in 2018. The view that rates would keep falling, or at least stay low, in contrast to increases in the West, failed to pan out, as these three countries, not to mention Hong Kong and China, had to step in and defend their currencies as the stronger dollar and crises in Turkey and Argentina began to sap confidence (rightly or wrongly). With India’s Prime Minister Modi about to fight a general election and President Xi’s long-term legitimacy resting on further prosperity, growth remains a priority for both names for social and political reasons. Both nations are forecast to deliver, but Chinese domestic growth in particular seems to be slowing, regardless of the metronomic growth shown by the quarterly GDP figures, perhaps because of the pressure being brought to bear by American foreign and economy policy. Decelerating momentum in retail sales, fixed asset investment, industrial output and loan growth is apparent and the so-called Li Keqiang index, named after the Chinese Prime Minister’s three most-trusted economic indicators is also looking sorry for itself. This slowdown in growth in bank loans, rail freight and electricity consumption may reflect worries over the impact of President Trump’s tariffs but it also raises questions about the very foundations of the Chinese economy and its reliance on cheap debt and fiscal and monetary stimulus. China is now the world’s biggest market by banking assets, with data from the China Banking Regulatory Commission showing that total bank assets had reached $38 trillion by the end of 2017 – up from just $6 trillion a decade ago. That sort of growth, say the doubters, cannot come without a few sour loans and some poor capital allocation along the way (and in 2017 the People’s Bank of China even warned of the risk of a Minsky Moment, when excess debt and poor allocation of capital come home to roost in the form of a financial crash and economic downturn). Attempts to cool debt growth and speculation could already be taking their toll on Chinese stock markets, and concerns over China’s economy are spilling over into the Antipodes. The Reserve Bank of Australia’s Governor, Philip Lowe, has left interest rates at their historic low of 1.50% since he took office in autumn 2016. 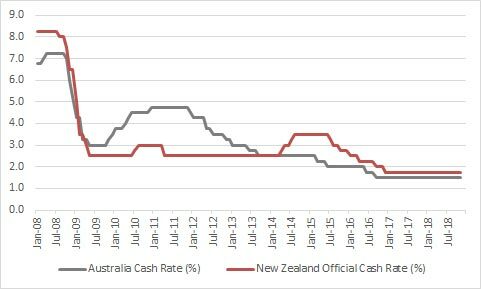 Meanwhile Adrian Orr, who only took the helm at the Reserve Bank of New Zealand in March 2018, has already dropped heavy hints that its headline borrowing rate will be held at 1.75% until at least 2020. Such loose monetary policy may have stoked house prices in Australia in particular but affordability has still become a problem. Refinancing rejections have soared from 5% of applications to near 40%, according to Digital Finance Analytics, as interest-only mortgages start to roll over and prices begin to sag, in what sounds like a spooky replay of the US housing collapse in 2007-09 that had far wider market and economic implications. If there is any good news about President Trump’s imposition of a second round of tariffs on China in September (with threats of a third in January), the renminbi and Shanghai Composite index appeared to take the move in their stride. They had already taken a battering, so it is possible to argue that a lot of the potential bad news is in the price. The renminbi trades at 6.86 to the dollar, a mark last seen in May 2017, while the Chinese stock market languishes in bear market territory because it has fallen by almost a quarter from the 2018 closing peak of 3,559 that it reached in January. 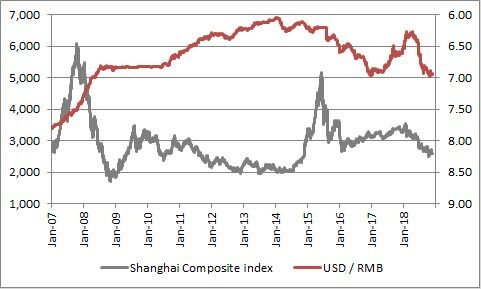 Worse, the Shanghai Composite trades at less than half of its 2015 and 2007 highs and is no higher now than it was back in January 2007, having entered a bear market in summer 2018, following a fall of greater than 20% from its January 2018 high. China has thus been a dog in its Year of the Dog and it will be interesting to see if the Year of the Pig, which begins on 5 February 2019, brings better performance – since China is either in deep value territory or an accident waiting to happen. 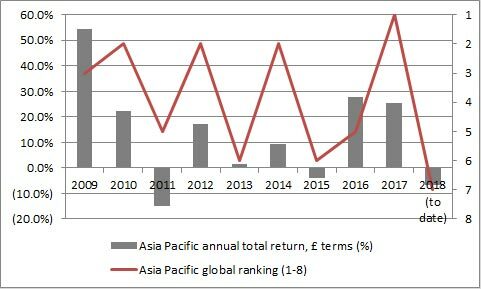 China’s woeful performance in 2018 may be one reason why the Asia-Pacific region overall slipped from penthouse to outhouse in the course of the year. After a first-place ranking in sterling, total return terms in 2017, Asia-Pacific equity markets came just seventh out of eight in 2018 as they were also caught up in the wider emerging market carnage caused by modest increases in the dollar and fears of a spill-over from the Turkish and Argentine crises. Only the Africa-Middle East region fared worse. Source: Refinitiv data. Based on MSCI Asia-Pacific ex-Japan index. Total returns in sterling terms, 1 January to 29 November 2018. In some ways, investors with exposure to Asia-Pacific assets are entitled to feel a bit miffed by this poor performance, as it can be argued that Seoul, Taipei and Jakarta do not deserve to be mentioned in the same breath as Istanbul or Buenos Aires, as least when economic management and debt are under discussion. Japanese investment bank Nomura’s proprietary Damocles Index suggests that very few if any major Asian economies are at risk of a currency crisis. The research looks at 30 emerging economies and eight macroeconomic indicators, including external debt, foreign exchange reserves, interest rates and fiscal and current accounts and then gives a score, with the highest 200. Anything over 100 suggests a currency is vulnerable. Sri Lanka and Pakistan both feature near the top of the rankings but neither is likely to feature too heavily in advisers’ and clients’ asset allocation discussions for 2019 and beyond. Of the mainstream Asian markets, only Malaysia really gets a mention. This reflects the work done by the Institute of International Finance, International Monetary Fund and World Bank which also suggests that, on the whole, Asia’s debts are relatively low and relatively sound. This does not mean investors can be complacent, as China must be watched and other factors, such as weakness in technology stocks or global trade concerns, could still make their presence felt.